What Are the Externalities of “Drill, Baby, Drill”? 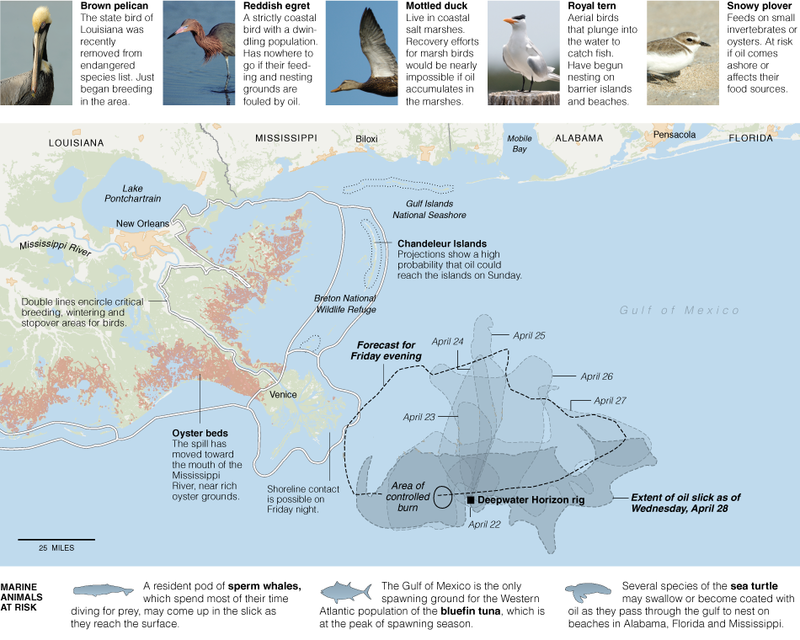 Figure from CAMPBELL ROBERTSON and LESLIE KAUFMAN, “Size of Spill in Gulf of Mexico Is Larger Than Thought,” NYT (29 April 2010). I’ve seen no estimates of the impact on the economy from the spill. That’s largely because the extent of the spill is still being determined (they’ve just upped the estimate of the rate of flow, and much hinges upon how long it takes to cap the flow). …Nancy Kinner, co-director of the Coastal Research Response Centre at the University of New Hampshire, explains that oil rigs rarely have accidents: “The risk might be one in 1,000, or one in 2,000.” Of course, she adds, there are hundreds of rigs out there. This spill might be shocking; but it was hardly unforeseeable. For earlier discussion of drilling in previously restricted areas, see  . This entry was posted on April 29, 2010 by Menzie Chinn. While we certainly do not want an oil slick covering our oceans the current oil “spill” is approximately the same size as the total amount that naturally seeps into the Gulf of Mexico every year. But the natural seepage is never a problem because bacteria and wave action break down the oil so that no life is threatened. If there are massive costs involved with this spill I would imagine that most will be related to “clean-up” efforts that are totally unnecessary and may even be more harmful to the environment than the spill itself. But we will ever know the truth about the real impact and cost of the spill because the media has a bias and a vested interest in making it appear as awful as possible. Clean water doesn’t lend itself easily to a Pulitzer Prize. RicardoZ: Does the “current spill” equivalence to annual natural seepage pertain to the original estimate of the spill on day one, or to say three month’s worth of spill at the elevated estimated rate of spill? In either case, I (as well as the other Econbrowser readers, I suspect) would welcome the source of data for the annual natural seepage rate. You are also not considering the externality of not drilling: the explicit and implicit cost of our wars in the middle east. One relatively small portion is the effect on the local fishing industry. There would presumably be some long term effects on the local fish populations and you could probably do a present value calculation on the lost future commercial fishing as a result of it. I’ve also been curious what happens to insurance rates for these rigs after events like this occur. That, of course, is a little far afield, but I’m still interested. Ah, good ole ricardo spreading his totalitarianism. I know it man, you hate nature as much as America. T-Dub: If you had read the links provided at the end of the post ( ), you would have seen opening up increased drilling would have had minimal impact on domestic output (and along the way, on prices, as well). See in particular the supply and demand framework, and back of the envelope calculations, laid out in . Why is this an externality. BP will pay for the clean-up. I suggest that anyone who thinks that nature can handle a years pollution spread out over thousands of miles, try drinking a gallon of Wild Turkey in one night. Not all of the costs are fully borne by just the clean up costs. Granted, those are probably the largest direct costs, but there are many other both short and long term effects that they will not cover with their clean up costs. The economic cost will mostly be the government reaction. Beyond the attempts to contain it, most the damage will be self inflicted. They’ll likely mandate costly and damaging cleanup. One thing we learned from Valdez is that much of the much of the cleanup efforts did more harm than good. The ecological system is pretty resilient. More Interesting to me is Opportunity Cost. Why are we Still Drilling for Oil when Wind Costs have dropped so Dramatically? A wind turbine now pays for itself in 5-7 years. The rest is Pure Profit! Why are we wasting our investment in a Dying Industry, when we could be investing in a Growing Industry? An industry that would allow us to WALK AWAY from the Middle East? Electric and Hybrid Vehicles can cut demand so that we don’t need to drill in these waters. I have never once heard that analysis of the Valdez clean up except from the oil industry. Is there an objective analysis that reflects that conclusion? We could build lots of Generation 3 nuclear power plants and all drive electric cars. They are about $5B per GWe. But it would take a while. Krugman just posted this offshore windfarm project. Using the 183Mwe ave output and $1B in cap cost, it looks like the same cap cost per output as the recent 3rd gen nuke plants that started construction in the US. Big differnce is you need 25 square miles of ocean to generate less than 1/5th the power you get from a few acre nuke site. Plus you need to add about $5 Million a mile for transmission lines to wherever the market is. Better we tax energy use to capture the exernalities. Agreement extends from Mankiw to Krugman. So, what’s the holdup? In that vein, I wonder if airline deregulation, which got rid of artificial barriers in the industry and reduced prices, was ultimately a good thing, given the negative externalities of air travel (air and noise pollution, global warming, spread of disease, and providing weapons of mass destruction, the latter costs of which are being largely borne by taxpayers instead of being internalized to the air travel industry). http://www.sciencedaily.com/releases/2000/01/000127082228.htm (sorry, don’t know HTML.) The natural seepage per year is estimated at 2x Exxon Valdez levels. The link also has some articles about the damage done by Exxon Valdez 17 years later, but no translation into dollars. Better we tax energy use to capture the externalities. Agreement extends from Mankiw to Krugman. So, what’s the holdup? It remains to be seen if this accident is equivalent to the Exxon Valdez. If it becomes a bigger disaster you can kiss offshore drilling goodbye. All that crap about modern ocean rigs being much more safe nowadays was just that…crap. As oil becomes harder to find we are forced to go deeper and farther to get it. At some point it finding more oil becomes more risky and expensive. The world has plenty of energy sources that are cleaner, more abundant, cheaper and available to all. We just need to develop the technology to collect it. The mantra “Bill, baby, drill” needs to go the way of the horse and buggy, the record, and the manual typewriter. This is a perfect example of the sheer absurdity of the worldview espoused by the free market ideologues. Clearly, the solution here is to just let Transocean fail, and do nothing else. No bailouts!!!! It’s not the government’s job to get involved in these matters. If the oil slick decimates all of the industry in the area, that’s too bad, but the government must NOT intervene. This example ought to be being shoved down the throats of all the Tea Partiers and right wing pundits right now. Here’s a cost some will miss – Any company that processes gulf seafood will have to implement an additional quality control program to make sure no oiled seafood makes it to the consumer. I worked for a salmon processor the summer of the valdez spill. Every load of fish had to be checked in addition to spot checks on the canning line, and in the freezer plant. If oiled seafood from the gulf region makes it to market and it receives headlines, the government will either ban the commercial sale of seafood from gulf, or the consumer will refuse to buy it. Either way, the industry dies for a few years. If you think BP will cover all these costs you are only partially right. Today it is 2010, 20 years after the valdez spill. Exxon begain making punitive damage payments last year and is still making them this year. Many Alaskan fishermen lost their boats and their livelihood while Exxon appealed lower court decisions all the way to the Supreme Court. Evntaully, Exxon got the damages reduced to about 10%-20% of what lower courts twice ordered them to pay. This spill will devastate the fishing industry in that region of the gulf. While we are debating the monetary costs, there will be a number of folks who will lose jobs, a family business or their livelihood. Substance abuse, domestic violence and suicides will rise for those affected. Put a cost on that and then watch people suffer as BP fights damage awards tooth and nail. Brian, I’m not sure. I’m going by mostly by vague memory. I believe Bjorn Lomborg’s Skeptical Environmentalist looks at it, so that might be a good place to look for studies cited. They probably are the oil industry ones you are referring to though. The oil companies are probably pretty much the only ones to study the effects. IIRC correctly, a couple things need to be considered. The places that were studied probably weren’t large, so it’s possible that when big areas are hit, clean up is necessary. I’d think cleanup should be done, but doesn’t need to be too thorough. 2nd is that the type of oil is very different. This stuff is much lighter. It probably won’t hurt animals as much in the short term, but might get into their systems more. Plants and bacteria might be more or less able to process it. My guess is that it will be harded because it is more fluid. But then, I’d guess the wetlands are probably really good at dealing with this stuff. The big problem is monitoring food and deciding what is safe. I strongly doubt the damage from this spill is permanent. RichardOz is correct. I always find it fascinating that well meaning people have no difficulties fully supporting permanent habitat destruction but go into hyper vigiliant hysterical overdrive when oil is spilled. Funny, American liberals through their Democratic Party funnel billions to Israel for violent colonialism and ramped up habitat damage without a second thought but get all teary-eyed over an oil spill. (We know that Israel is not a pressing problem because the head liberal guru Paul Krugman never talks about it.) Subsidize 3,000 to 5,000 plus square foot homes on massive sprawling lots with gorgeous 19th century-style well-watered Victorian lawns? Not a problem. The lowest excise taxes on dirty fuel among the rich OECD countries? Aren’t Americans entitled to cheap fuel? Unrestricted access to fish resources? It is all part of American colonial entitlement. Americans deserve to mismanage the environment. The Old Testament God wanted American liberals to go forth and destroy the Earth and from what I see they are doing a great job. I wonder why we haven’t found a way to efficiently, massively leverage perhaps the strongest force on earth, ocean currents (and rivers), such as via “underwater windmill”. I’ve found articles on small projects of this sort initiated in the last couple of years, but I don’t think I’ve ever seen news about it other than through my own online search. Perhaps the upfront fixed costs and current state of technology make it economically inferior to other energy sources in the short term. But does anyone have thoughts/info on this? If it’s on a river, it’s called “hydropower”. (see Hoover Dam for the biggie) They say most of the significant sites in the US have been exploited already. I had a Canadian energy trust that was doing small projects on some rivers up there. But ocean tidal power is an area they’ve talked about since the Arab Oil Embargo. I heard of people doing studies again, but I don’t know the feasibility and if anything is moving forward or not. But it’s good to keep a few numbers in mind when deciding what sources can be significant, and what will always be a little boutique power shop for some quaint community somewhere. Krugman’s windmill project above is 183 megawatts, and takes up 25 square miles of ocean. Wind turbines don’t “consume” the land or ocean between them. Cows and ships can use those spaces quite nicely. Right now 60 acres per turbine is pretty standard (probably 1.6MW). Farmers have often gotten about $4K per 1.6MW turbine, which meant about $40K on a 640 acre farm. 10 turbines means they only lose 5 acres of productive farmland (less than 1%), and perhaps double their net income. That’s huge money for a farmer. As far as land requirements of conventional generation: The Clinton Power Station is located near Clinton, Illinois, USA. The nuclear power station has a General Electric boiling water reactor on a 14,300 acres (57.9 km2) site with an adjacent 5,000 acres (20.2 km2) cooling reservoir, Clinton Lake. Due to inflation and cost overruns, Clinton’s final construction cost exceeded $2.6 billion, leading the plant to produce some of the most expensive power in the Midwest. The power station began service on April 24, 1987 and is currently capable of generating 1,043 MW. The Clinton nuclear plant uses 20 acres per average MW, and a 3MW wind turbine on a 1/2 acre uses 1/2 acre per average MW. Coal and nuclear also have to add in the space used for mining – there are 70,000 existing and old coal mines in the US. There are 525,000 operating oil wells in the US, and probably 10M abandoned or dry wells – shouldn’t we include those somehow in space requirement calculations? Yes, although you’re right that I should have mentioned it, I am, of course, familiar with turbines in rivers (and by the way, definitely best days to whitewater raft down Maine’s Kennebec River is a day of the turbine test — holy moly!). But I’m assuming that dams aren’t applicable in some cases (due to cost or drawbacks such as environmental) where I would think there would be some alternative. In any case, I’d like to know about the prospects and limitations for harnessing the power of ocean currents (and perhaps tides). I’ll see if I can dig up links of projects from an email I sent several months ago. If you research old nuke projects you will find many horror stories, because the strategy of environmentalists was to tie the projects up in court forever and cause cost overruns. Now, the 57 square kilometers for the Clinton plant defies all common sense. If you have seen a power plant, it is not 57 square kilometers. They do need a cooling a pond, or sometimes they are on a lake or coastline. The Gen 3 units are 1.1 GWe and typically two are built to a site. Maybe 4. Japan did a successful Gen 3 project completed in the late 90s. I’m sure farmers have room for windmills. The new project here says 25 square miles of ocean. Lets guess that means 1 mile deep and 25 miles of coast for 183 MWe? The point I was trying to make is that will only supply a minor percentage of the total countries need. We run out of coastline pretty quick. Then the other problem is transmission lines. I read a paper done by a Colorado U. prof who was looking at wind and solar and trying to compare costs. A problem with both is they generally will be located far from urban areas and will need new transmission lines built . He costed that at $5M a mile. The coal mines and oil wells are there already, so they have their space. But we need to find somewhere to sequester CO2, otherwise we have a whole bunch of expensive coal plants to throw away. We need to be thinking about saltwater thorium nuclear reactors; built in small footprints. The goal should be to create small plants that can feed small cities. Rather than spending $2B, we should be targeting $100M per facility..
Worldwide, we should be demanding of our governments to invest in the research to create these facilities. We need to end our use of coal and oil. Thorium is the best solution in my opinion. Only economists think what happens by the laws of nature are externalities. If economists were to actually place their economics into the real world, supply and demand, cost and benefit, would be computed for everything, including the unpleasant cost of lying on a beach and smelling the oil and realizing oil is staining your clothes. But you can also think of the jobs BP will bring as it hires people to attempt to erase the costs of human activity as if people don’t matter, or don’t exist because they are external to the economists equations. I dunno DWhite. I’ll bet plenty of Democrats live in huge houses on large lots. Take a look some time at the houses and lots prefered by graduate-trained biologists. They are huge! Aiming for a big ecological footprint I guess. I’ll bet that most vote Democrat in the USA and for one of the centre-left or so-called ‘progressive parties’ here in Canada. I don’t see Democrats get too upset over the heavily subsidized agricultural sector–probably the most generous state-sponsored program of habitat destruction among the rich OECD countries. Have Democrats been vocal critics of the emission regulation approach to the nasties from direct fossil fuels? No. Are the Democrats leading the movement to cut subsidies to detached home buyers? No. Increasingly, Obama is being criticized for failing to quickly do a big government takeover, and for failing to quickly do a bailout. And the argument is based on government needing to be better at dealing with stopping oil well disasters than BP. Also for failing to impose more regulatory authority on BP before it started drilling. In a time of high unemployment, we can not afford the costs of unwise investment in productive capital that will require hiring millions of scientists, engineers, machinists, factory workers, and construction workers. The government must provide welfare and job retaining for millions of factory and construction workers to move them into health care, and attack the price of housing so wise investment in rising housing prices will create the wise investments in a housing boom of big houses in developments distant from jobs, other than construction jobs. GNP: I’d like to cut ag subsidies. I’d like to reduce the subsidy to debt financing, including that to residential investment. And I prefer taxes to direct controls on most emissions from use of carbon fuels. Point of information. What the heck is a “graduate-trained biologist”. Well, it depends. What are you building? 138MW is only 690A at 115kv (could be fed by one smallish (say 653ACSR) unbundled conductor per phase on a single radial line). I’ve built 115kv lines in California for $.25M per mile, and overhead 115kv probably averages about $0.5M here (site matters). A price of $5M/mile is probably for building huge extra-high-voltage trunk lines (at 345kv to 765kv) between regions capable of carrying 1000’s of MW. No matter where your generation is, you won’t have to build much of that. Cost of interconnection is a valid critique of technology-specific (but non-site-specific) generation estimates. Location matters, and distance is not the only, or even the most important variable, sometimes. It’s probably much cheaper to build 10 miles of equivalent transmission in the Great Plains than 1 mile in NYC for instance. Having a great deal of generation and a dense network all in the same place, will lead to needs to replace large numbers of overstressed transmission circuit breakers, at great expense, even if virtually no new transmission right-of-way or lines are required. Both he and the DOE say that where large windfarms and large solar projects are likely to be built, it would take probably at least a couple hundred miles of new transmission lines. I haven’t designed them (I have designed electric motors), but I used to hear one of the reasons for high voltage is that transmission losses are much lower and that is important for long haul. For instance, PGE is building a solar thermal plant (about 200MWe size) in the El Centro area and is building lines to San Diego. These go thru the mountainous national forest reserve between the two areas. Menzie inquired “What the heck is a “graduate-trained biologist”. Perhaps that should read graduate school-trained biologist as in a person who has obtained an MSc or Ph.D. degree in biology. Apologies. As for your mini-platform, I can only guess that you either belong to the Democratic Party or vote Democrat but I do appreciate the summary. Menzie wrote: I’d like to cut ag subsidies. I’d like to reduce the subsidy to debt financing, including that to residential investment. And I prefer taxes to direct controls on most emissions from use of carbon fuels. In a nutshell, your problem Menzie is that you are an elitist. You probably share values and normative policy analysis with a few thoughtful Republicans as well as a growing number of leaders of enviro-activist groups. I take issue with the folks that think partisan party allegiance or power really matters in a mature democracy like the USA. In a well functioning democracy one or both of two forces will percolate to the surface and shape the major resource allocations: core shared values and/or the agendas of the most powerful, well-organized special interest groups. The parties are mere messengers. This oil spill is bigger than just about anything experienced in previous decades. But so far, the Gulf states have been lucky in that relatively little has lapped on shore. Already previous political support for off-shore drilling is being withdrawn. Why? What is wrong? Did not the Obama administration take into account the possibility of this kind of accident happening? This speaks to gross incompetence. No wonder Americans do not seem particularly preoccupied with the possibility of regional nuclear war. I can imagine the hindsight politicking. Regula: I work for an investor owned electric utility in CA. I have repeatedly performed studies and written reports (and supervised and peer-reviewed others’ efforts doing same) detailing the exact facilities needed and costs involved in connecting applicant owned renewable generation to our grid. The interconnection process is idiotic as a resource allocation process. This needs to be re-integrated with the utility part of the business. We have studied billions of dollars in upgrades to our transmission system to integrate zombie (stupid, won’t die) projects which are far in excess of current or future needs. Because all of these projects interact with each other and yet all of these projects compete with each other the optimization process is currently suboptimal (since the folks making the generator decisions are the proverbial blind men feeling an elephant). However, cost of interconnection is not driven solely or even primarily by transmission line length in many places. If people want to build merchant solar (and can figure out how to do it cheap enough), I could (if I were not prohibited from doing so) tell them where to put it on my grid where it would actually reduce, rather than increase transmission costs (land or site lease costs would be higher, however). Wind and geothermal are more site constrained, and generally are driving transmission expansion…but gas and load drive plenty of transmission expansion as well. In my area the green-gen is not the only benefit from the transmission xpansion, it’s just the triggering event. Most of the places in CA where transmission expansion is being driven are places that already needed it, green-gen just gives the folks a hammer to beat the regulators and intervenors over the head with. The first 3 Transmission projects are driven by renewables and ancient overtaxed grid. The two TRTP projects are justified by wind, the EITP by solar thermal generation. They have substantial grid benefits unrelated to renewables. DPV2 is driven by merchant gas generation having been built in AZ back a few years during the deregulation gold-rush and old utility generation in CA having been sold off during deregulation and being decommissioned by merchant generators (maybe faster if the coastal commission outlaws open-loop cooling). The next 5 transmission projects listed are all driven by load growth and sprawl. Note that a lot of system upgrades and costs aren’t listed here, since they are not subject to licensing processes. If a $1B dollar transmission project allows the integration of 4500MW of wind power, it adds $0.22/W to the installed cost. That isn’t trivial, but it’s about 10% of what a wind project costs to develop these days, and about 20-25% of what it probably ought to cost if the market weren’t so f’d up. Wow, GNP. What’s up with all the random bile? You’re the first person I’ve ever heard with a beef against the demographic “Americans with graduate degrees in biology.” Somehow you think they all live in mansions? Then Menzie points out that she (she, right?) constitutes a counterexample to your earlier assertions and you ignore that to rant, without evidence and a propos of nothing, about her being an elitist. There’s a real problem in this country with people whose attitudes and votes are openly determined not by policy preferences, but by what they’ve convinced themselves other people think.